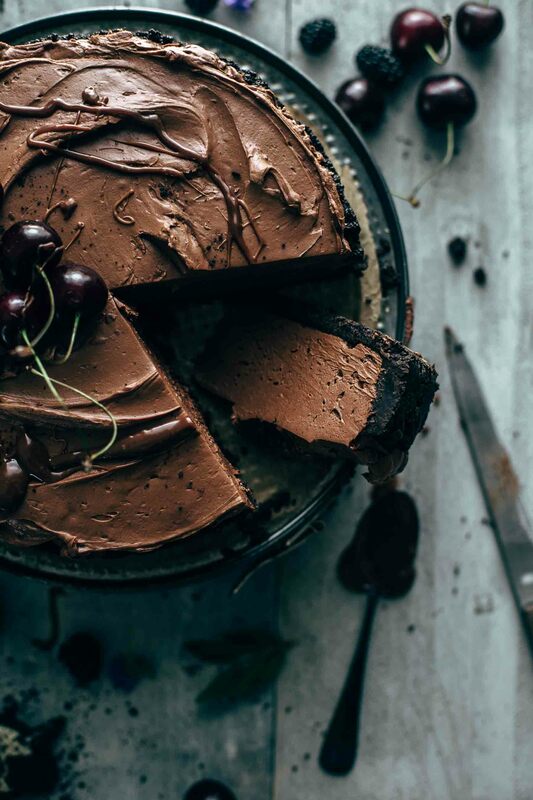 This No-Bake Chocolate Cheesecake Recipe is prepared in 10 minutes, and you need just 8 ingredients. It is beyond creamy and super chocolatey. Ready for chocolate heaven? I guess the answer is yes?! Today, I show you how to get a full load of chocolate without turning on the oven. Awesome, right? 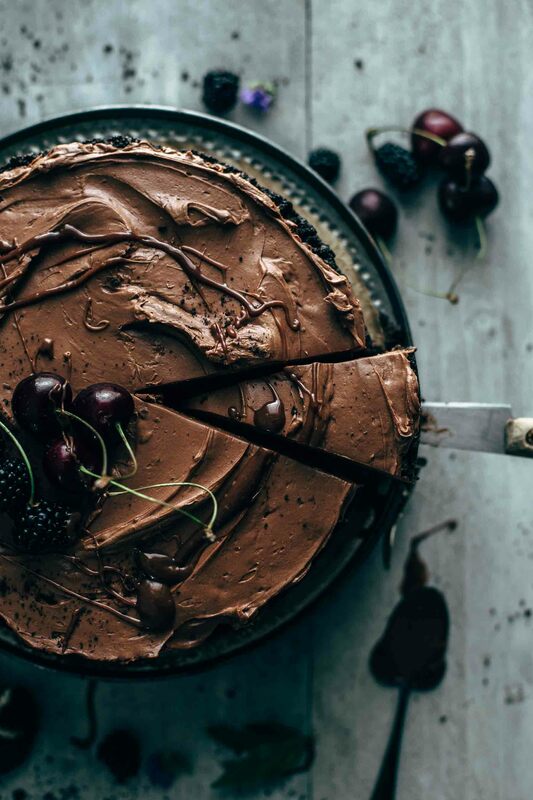 This No-bake Chocolate Cheesecake recipe is great for lazy baking days. Because this recipe is so easy and quick, we can chat a bit before we head into the recipe. Grab a cup of coffee, I’ll wait here for you. So, how is it going? Were you already on vacation? If so, where were you? This year I’m not abroad, I stay in Austria. I save all my money for the moving to the US. I was last year two weeks in California, and I spent a fortune. Guess on what I spent all my money? Exactly. Clothes and food. We were super lucky with the flights. They were extremely cheap. And we were sleeping in cheap motels. The rental car was also a great deal. This was all planned to have as much money as possible to spend on stuff we love. I’m not an all-inclusive tourist. We did this one time, and we were so bored. This was in Cuba. I think we both are too much aroused that we can’t enjoy doing nothing for two weeks. And I don’t want to be the whole time with other tourists my whole vacation. It was very important to us that we feel and explore the real America. Not just tourist places. My biggest tip for you is to talk to the locals as often as you can. In America, the people are so lovely and open. We got a lot of tips which places to check out and where to eat. It was so great when we were somewhere where just locals were. Americans, Mario, and me. I felt the first time in my life at home. I love the US!!! As I said, this year we stay at home to save all our money. So I need to bring some joy to my life in another way. 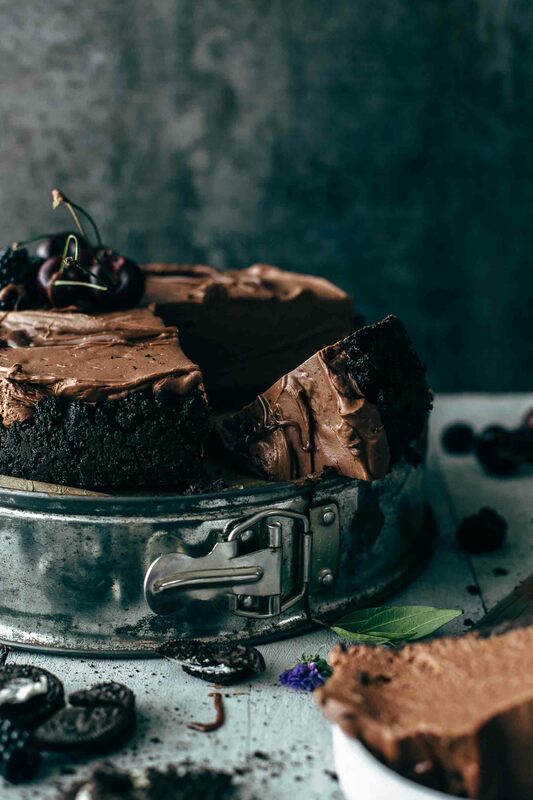 This no-bake Chocolate Cheesecake recipe is a great way to do so. I love no-bake recipes. They are just great. But how many no-bake recipes did you find, where you have to bake the crust? Correct. A lot! Ok, when making anything with a single pie crust, you don’t have any other chances than bake it. The no-bake is then referring to the pie filling which is not baked. But technically, it’s not really a no-bake recipe, is it? When making a no-bake recipe with a crust, it should have any kind of cookie crust, like graham cracker crust, or Oreo cookie crust. 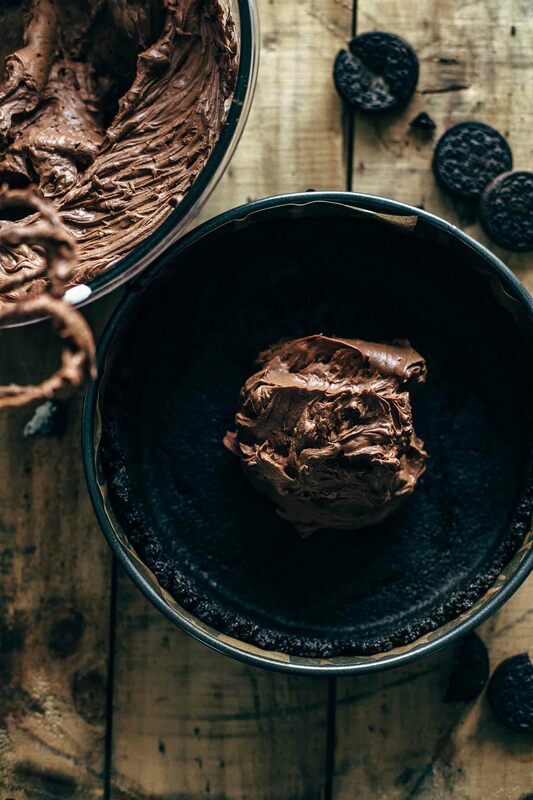 For this no-bake Chocolate Cheesecake recipe, I decided to go with an Oreo cookie crust. It has just 3 ingredients and is not baked. Woohoo. Crush Oreo cookies (with the filling!) into fine crumbs. The easiest and fastest way to do that is with a food processor. Alternatively, you can put the Oreo’s in a ziplock bag and crush them with a rolling pin. If you are angry and need to cool down, maybe this is the method of your choice. The filling is so extremely delicious that I had problems stop “trying” while mixing. I could spoon it without anything. It is super easy to make, and you need just 6 ingredients. Start with mixing the cream cheese until it is creamy. Then add sugar and cocoa and beat until combined and smooth. 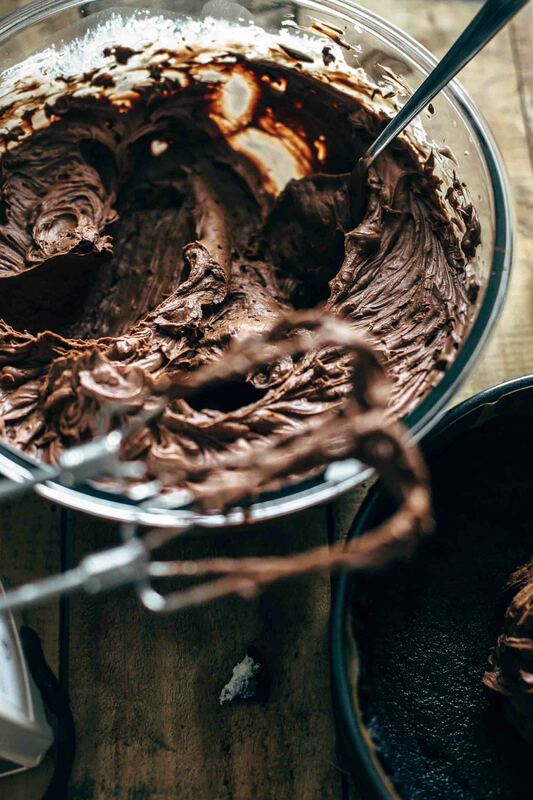 Any unsweetened cocoa powder works, no matter if dutch-processed or natural cocoa powder. Add vanilla and melted chocolate and stir until combined and creamy. I can’t point out enough how important it is to use high-quality chocolate of a brand you love. 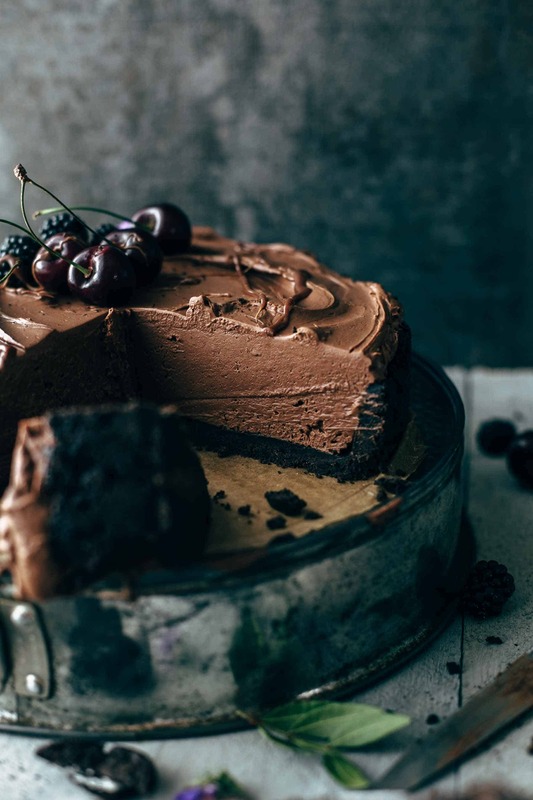 Because there are 2 cups of melted chocolate in this Chocolate Cheesecake, the taste of the chocolate has a high impact on the taste of the Chocolate Cheesecake. In the end, add heavy whipping cream and stir until creamy. Then fill the filling into the crust and chill in the fridge for about 4 hours or until firm. 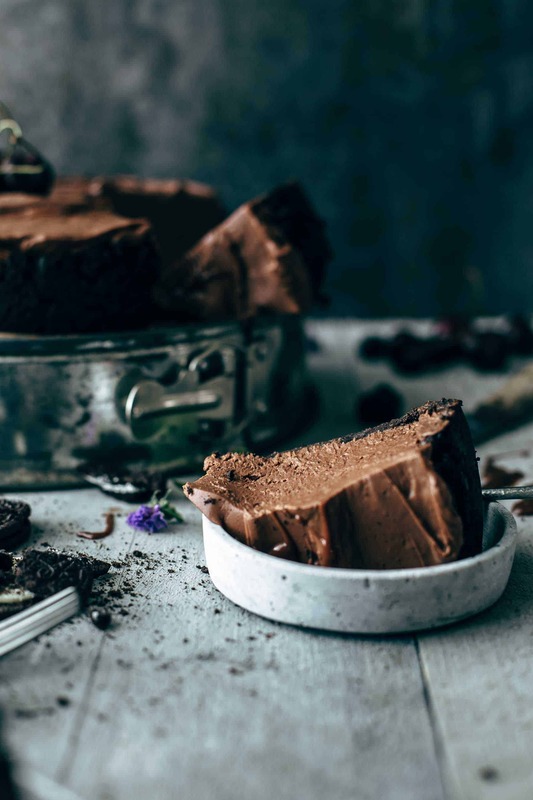 This Chocolate Cheesecake is very easy to make and please don’t tell me that you wouldn’t love to stuff your face with this beautiful chocolate cheesecake? 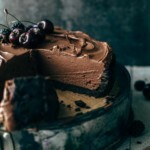 The photo below is my personal favorite of all Chocolate Cheesecake photos in this post. It makes me want to lick over the whole surface. Sorry about that, I know this is not ladylike or civilized at all. This remembers me on an ice cream shop in East LA called Little Damage. Their slogan is: “I licked it, so it’s mine.” So actually not a bad idea, right? I repeat it again: easy, quick, little ingredients, creamy, and delicious. I got hooked! 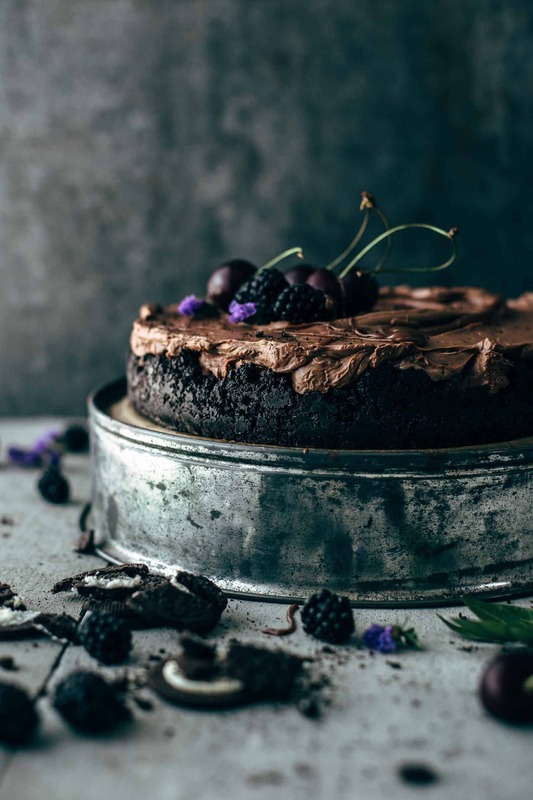 If you make this no-bake Chocolate Cheesecake recipe, leave a comment, rate it and tag a photo #alsothecrumbsplease on Instagram! Would love to see your snap! 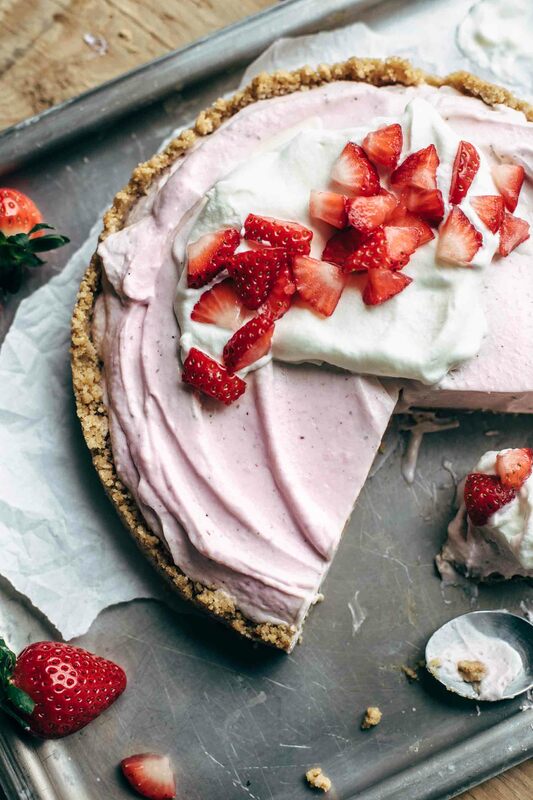 You may also like No-Bake Strawberry Cream Cheese Pie, Best Oreo Cheesecake, Salted Caramel Pretzel Cheesecake Bars, Soft and moist Blueberry Cheesecake Muffins, or click here to see all recipes. Line a 9" (23cm) springform pan with parchment paper. Set aside. Crust: In a large bowl, stir together Oreo crumbs, melted butter, and cocoa until combined and evenly moist. Transfer to the prepared pan and press crumbs into the bottom and halfway up the sides with the back of a measuring cup. Freeze until filling is done. Filling: In a large mixing bowl beat with a handheld or stand mixer fitted with a whisk attachment cream cheese on medium speed until creamy for about 1 minute. Add sugar and cocoa and mix until smooth. Stir in vanilla* and melted chocolate. Add heavy whipping cream and mix until soft peaks form about 1-2 minutes. Fill filling into crust and spread evenly. Chill in the fridge for 4 hours or until firm. Store leftovers in an airtight container in the fridge up to 2 days. This looks delicious and as always your photos are an inspiration to me! I will be making this tomorrow for a party on Thursday. I cannot wait to taste it! Hi Sabine, how to cut your recipe in half? 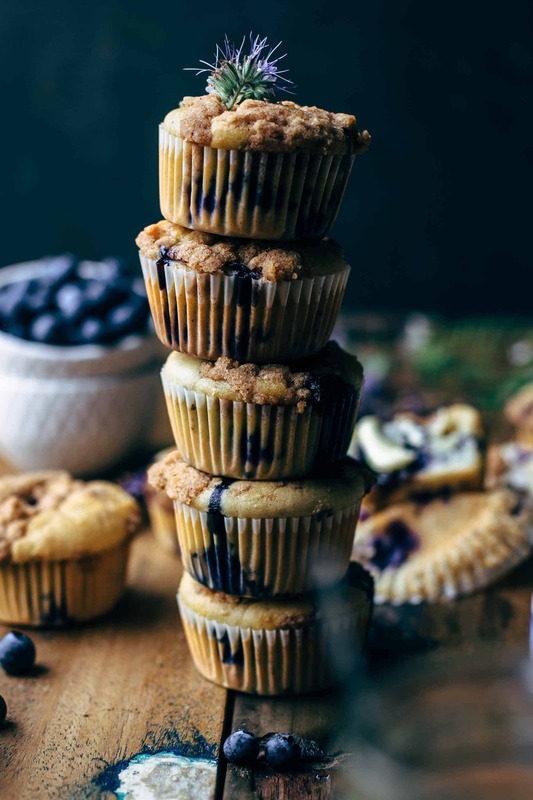 I want to give this recipe a try but because I am a beginner in baking, I dont want to waste the resource if I do mistake. Also because it’s only me who love creamy cake in my home, I will need to eat this all alone by myself. It’s better if I just try half the recipe first. Hi Desrina, you could use a smaller springform pan, something like 6 inches wide. You could also try to make it in a casserole or loaf pan but please make sure to line with parchment paper with enough overhang on the sides to easily lift the cake out of the form. The ingredients you can cut by half. Thank you so much for your nice feedback! I’m beyond happy that it turned out great and your son liked it. Have a great day! Looks amazing and can’t wait to try it. Just one question please… must the heavy whipping cream be whipped before mixing it into the mixture? Thank you so much! I’m happy that you like it. No, the whipping cream needs to be liquid. 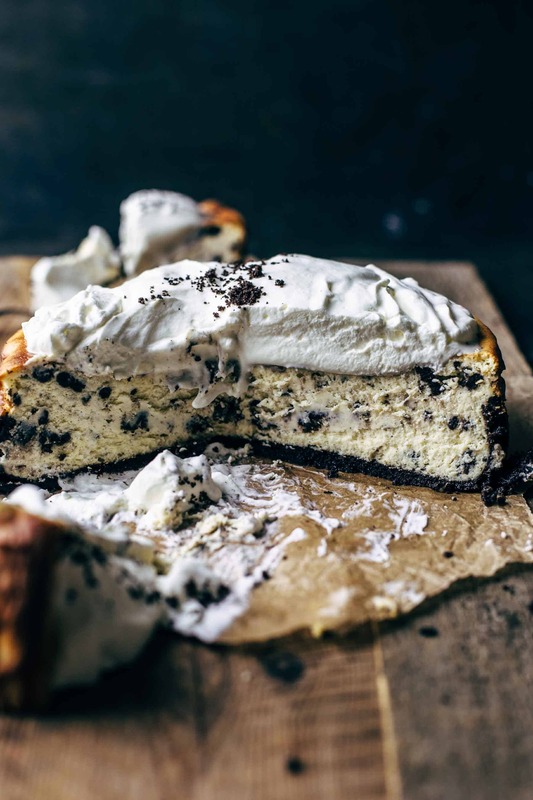 Just wondering have ypu ever frozen this cheesecake? I don’t recommend freezing this no-bake cheesecake because the consistency changes through the freezing and thawing consistency. I tried it once and was not very satisfied. Hope that helps!